Recent School of Music graduate Marcus Norris ’17 has been awarded the prestigious Eugene Cota-Robles Fellowship at UCLA. He will receive a full scholarship and a $100,000 fellowship to pursue his doctorate in music composition. Norris applied using his master’s thesis – a 12-minute work for chamber orchestra titled “Brown Eyes, Black Magic.” In the piece, Norris attempts to create a mysterious sound world where the listener focuses on the beauty of ever-shifting sonic colors. It pays homage to the “Black Girl Magic” campaign that CaShawn Thompson founded in 2013, which was used to empower women of color by highlighting their achievements in different fields. Having formerly studied music technology recording, Norris earned his master’s in music composition at FIU. As part of the university’s New Music Miami ISCM Festival, Norris – encouraged by professor and FIU Composer-in-Residence Orlando Jacinto Garcia – participated in masterclasses with cutting-edge composers such as Augusta Reed Thomas. It was through hard work and guidance from Garcia that Norris was able to win first prize in the 2017 Southeastern Composers League’s Philip Slates Memorial Competition for Graduate Students last March with his instrumental work “You haven’t Said a Word” for cello quartet. The piece will premiere live this fall in Havana, Cuba. It is currently available on iTunes, Spotify, YouTube and other major retailers under the name Marcus Norris Orchestra. 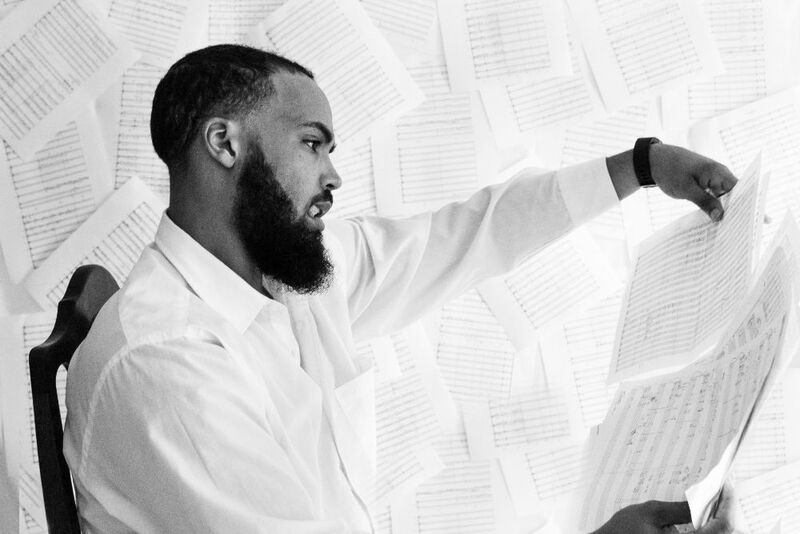 With the money from the competition, Norris plans to start his own production company and record label, South Side Sound, releasing the first song from his Orchestral/R&B/Neo-Soul fusion project. “Starting a label will allow me to put me and my music-creating friends in a position to make more lucrative business moves,” he said. As the recipient of a diversity fellowship, Norris also feels the need to give back to the community. He especially likes to help young musicians, recalling his earlier days when he was 13 and already thinking about how he would make music his life. 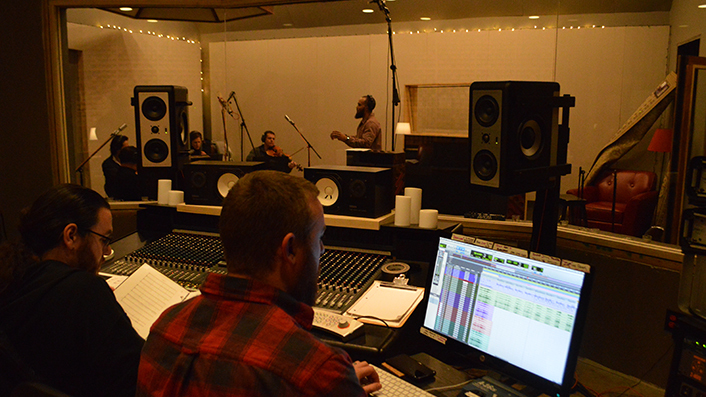 Norris working in the studio. He’s worked as a studio instructor, producer and engineer for Donda’s House, a nonprofit based in Chicago, whose mission is to support young artists. He has also enjoyed success producing music for artists such as the Grammy award-winning Rhymefest, Tink and Jean Deaux. At the age of 25, Norris’ works have already been performed by organizations such as Chicago Composers’ Orchestra, Jackson Symphony Orchestra Community Strings and Hopera & The Hip Hop Orchestra. He also worked with FIU aquatic ecologist Evelyn Gaiser, who translates lake data to music, by transcribing her musical composition for a string trio. Their work was showcased at TedxFIU 2016. With such a wide range of diverse musical interests and talents, it is also no surprise that Norris has been called a “new musical talent in our midst” by Chicago’s N’digo Magazine. I went to his performance back in April when he was showcasing his work as part of his Master’s dissertation. It was great to see so much talent bring his work to life. Bright future for this young man! Thanks so much for the kind words Sonia! I’m glad you enjoyed the music.